First Lieut. John Hodges David, Jr., whose name appeared in the overseas casualty list yesterday morning as having been killed in action on March 1, is the first South Carolina officer to lay down his life during the present war, and is the first Citadel graduate killed in action since the entrance of the United States into the struggle. Lieut. David hails from Dillon, and was graduated from the Citadel in the class of 1914, being especially commended for efficiency in military tactics. He was commissioned as a first lieutenant following his graduation from the first Oglethorpe training camp, and volunteered for overseas service. All business houses in Dillon were closed yesterday between noon and 8 o’clock in respect to his memory, and the city schools observed a holiday. News of the young officer’s death was received by his parents Monday night, and has cast a damper of gloom over the entire town, where he was universally liked and admired. No details of Lieut. David’s death have been made public, only the bare announcement he had been killed in action. As a squad of twenty-seven were totally obliterated in addition to the officer, it is presumed that he was in charge of a patrol or raiding party that unexpectedly clashed with a Hun patrol in No Man’s Land. Lieut. David was born in Dillon twenty-five years ago, being the son of Dr. and Mrs. J. H. David. His early education was received in the public schools of Dillon, and in the fall of 1910 he entered Furman University in Greenville. 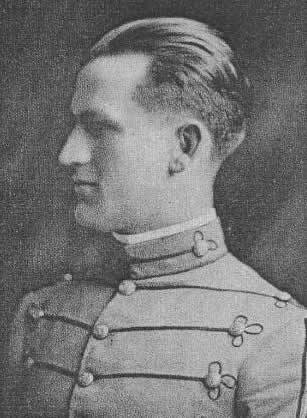 His longing for a military life, however, led him to forsake Furman for the Citadel, and he was enrolled as a student in the local institution in 1911. He served in the cadet corps as corporal, sergeant and lieutenant, and in addition was exceedingly active in all other phases of college life. He was a member of the varsity track team, and also took great interest in football. Among his college mates he was immensely popular and had scores of friends throughout the city and State. After leaving college in 1914 he entered business with his father, who was engaged in farming on an extensive scale. When the call came for volunteers for the first Oglethorpe camp, he was among the first to answer, and after graduating was commissioned a first lieutenant and assigned duty at the front. Lieut. David is survived by his parents and five sisters. The only other Citadel man to be killed in the service of his country while on actual duty in recent years was Lieut. J. K. Bolton, of the class of 1916, who was shot by a native of Haital while landing in the black republic with a detachment of marines. – Source: The News and Courier, Charleston, S.C., March 13, 1918, p.1. Obituary courtesy of the South Carolina Room, Charleston County Public Library. Photo courtesy of The Citadel Archives and Museum. “Colonel O.J. Bond, Class of 1886, served as superintendent and president from 1908 to 1931. During his administration, The Citadel moved to its present location and greatly improved its academics.” – Source: The Citadel And The South Carolina Corps of Cadets, William H. Buckley, 2004, Arcadia Publishing, p.55. Lieutenant Nicholls, whose body was never recovered, is memorialized at the Loos Memorial, Dud Corner Cemetery in Loos, France. Visit his In Memoriam page to learn more.